The Government’s backing for a new runway at Heathrow is facing a new legal challenge – this time from the backers of the independent ‘Heathrow Hub’ scheme. 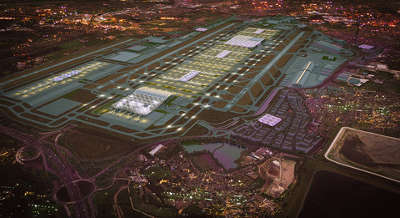 Lawyers acting for Heathrow Hub, which proposes expanding the airport via an extension to the existing northern runway (ENR), have filed court papers seeking a judicial review of transport secretary Chris Grayling's decision to designate the Airports National Policy Statement, which gives approval to the airport's own North West Runway (NWR) plan. Heathrow Hub Ltd and its sister company Runway Innovations Ltd are seeking permission for judicial review on five grounds. Two of these relate to ministers ‘making it an effective precondition of selecting the Heathrow Hub’s ENR scheme that the Airport would guarantee that it would implement the scheme’. They argue that this effectively gave the airport, which was a competitor to their ENR Scheme, a veto over it. They also argue that Mr Grayling was ‘factually incorrect’ to assume that the NWR scheme provided greater capacity for air traffic movements (ATMs) and more respite (pauses for local residents from noise exposure), despite evidence demonstrating that the ENR scheme would provide at least the same capacity in terms of ATMs as the NWR scheme, which ‘could not in practice deliver the levels of respite attributed to it’. They add that Mr Grayling failed to provide any or ‘any adequate and/or intelligible reasons’ for the assertion in the National Policy Statement that the NWR scheme provides greater capacity for ATMs and more respite than the ENR scheme. The group also claims that in rejecting their runway extension scheme partly on concerns relating to its safety and the implications of this for deliverability, the transport secretary acted unfairly in failing to explain those concerns. The Heathrow Hub proposal would involve extending Heathrow’s northern runway to a total length of around 6,650 metres with a 'generous' central buffer zone between two in-line runways, allowing aircraft to simultaneously land on one and take off on the other. The group claims that this provides the same new capacity as a third runway.